Unisex Elastic Pants & scrub Top set. 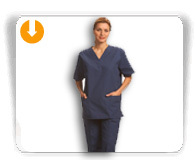 Top has two deep patch pockets set-in sleeves and side vents for movability. The pants are full elastic waist with two pockets.